Welcome to Jack's R Better! When it comes to auto repair service in Atwater, CA, you want the team of skilled automotive technicians that you know you can trust to take care of all your vehicle needs in a friendly, prompt and professional fashion. At Jack's R Better we have established ourselves as leaders in the industry offering professional services at affordable prices. Upon entering our facility you will see a clean work environment and be greeted by courteous staff who are dedicated to making sure your automotive needs are properly addressed. A Star Station, we are licensed by the Bureau of Automatic Repair. Our technicians are ASE certified so they can handle problems of all magnitudes. When you have an automotive issue you can trust us to troubleshoot to get to the real root of the problem. Our team is highly skilled in computer diagnostics so we can service all makes and models. You may be surprised to learn that we take the time to explain the issue in detail, telling you what needs to be done and how much these services will cost. Our policy is to only charge for the parts and the services that you need so you know that we never tack on any extra fees. Some things are better the old-fashioned way. We operate that way when it comes to treating customers with honesty and respect. Building lasting relationships with each client, we want to be the automotive repair team that you trust for all of your auto related needs for years to come. Having been in business for over 24 years, we have put hundreds of cars and trucks back on the road for happy clients in and around the Atwater area. Experience the excellence that is offered in professional auto repair service in Atwater, CA, by calling Jack's R Better today. Pick up the phone and call (209) 357-1952. We can have you on the road again before you know it! Jack's R Better - Auto Repair Service in Atwater, CA Welcome to Jack's R Better! 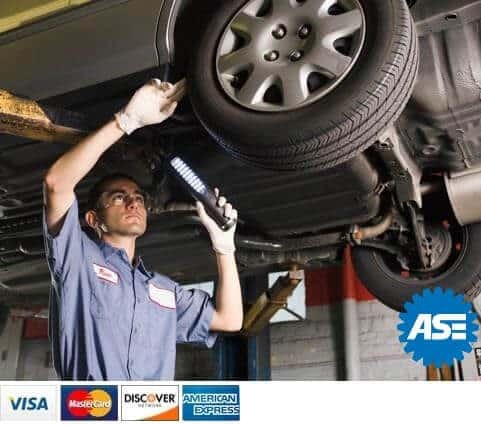 Best Auto Repair Service in Atwater, CA When it comes to auto repair service in Atwater, CA, you want the team of skilled automotive technicians that you know you can trust to take care of all your vehicle needs in a friendly, prompt and professional fashion. At Jack's R Better we have established ourselves as leaders in the industry offering professional services at affordable prices. Upon entering our facility you will see a clean work environment and be greeted by courteous staff who are dedicated to making sure your automotive needs are properly addressed. A Star Station, we are licensed by the Bureau of Automatic Repair. Our technicians are ASE certified so they can handle problems of all magnitudes. When you have an automotive issue you can trust us to troubleshoot to get to the real root of the problem. Our team is highly skilled in computer diagnostics so we can service all makes and models. You may be surprised to learn that we take the time to explain the issue in detail, telling you what needs to be done and how much these services will cost. Our policy is to only charge for the parts and the services that you need so you know that we never tack on any extra fees. Some things are better the old-fashioned way. We operate that way when it comes to treating customers with honesty and respect. Building lasting relationships with each client, we want to be the automotive repair team that you trust for all of your auto related needs for years to come. Having been in business for over 24 years, we have put hundreds of cars and trucks back on the road for happy clients in and around the Atwater area. Experience the excellence that is offered in professional auto repair service in Atwater, CA, by calling Jack's R Better today. Pick up the phone and call (209) 357-1952. We can have you on the road again before you know it! Copyright © 2019 Jack's R Better | All rights reserved.